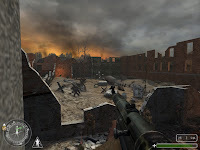 To be brief and to not spoil the outro sequence explaining the story behind, here is just a brief plot for this add-on: Simulates the 1942 defense of the Caucaus (kuban) area - if you've seen the Sam Penkinpah film - Cross of Iron - then it is the same place, just a year earlier. 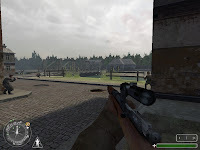 After several other release Yorkshire Rifles as got enough experience in mapping and scripting to make a real strong release featuring Intro and Outro map , custom skin and texture all being put together in a 5 maps episode plenty of action and great moments. 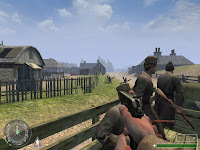 You will, in this custom made release, travel with a truck to fight and take the germans first line before retreat and battle to keep you defending lines (Bataysk), attack a village, drive a german car and take a 'too far' bridge (Krasnodar), fight through a maze of trenches in order to destroy oilfied tower (Maykop) and finally get back in the main town of Novorossiysk (divide in two part) where sniping will alternate with rushing through a destroyed city full of ambushes. This mission look exiting and it really is. Design is quite realistic and not repetitive changing a lot of environment during day and night nearly all feature from original game are visited here from driving vehicles, flying planes to mission objective always in a teamplay (squad) progression. There is no place to rest, it's really full of action and like it is told in the readme you need to progress to prevent enemies to spawn for ages in places you fighting through. Gameplay is perfectly drawn (weapon and health are well put all over the places), team objective senario are done like it should be and ambiance with amush fights and surpise is drop at the moment it was needed. There is for me no real complain about: objective are clear (even if i play with a French copy and Objectives are, i suppose due to this, not correctly displayed), difficulty is perfect, progression is well structured and playtime through mission is good. The only thing which bother me a little is that i associate russian battle with winter condition which wasn't the case here. 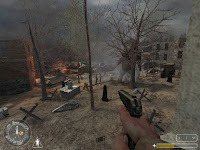 My opinion was made on a single play of this mission (a second try will perhaps change i litlle my point of view), which could easily be replayed in the future, my only disapointment being the fact that there is so much out here to be played in FPS sp that I won't take the time in the near future to do it. 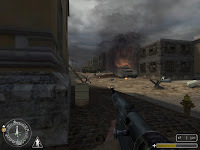 In Conlusion : A must have sp campaign that give us the opportunity to replay a not so known episode of the WW II.